Based on the novels by Margaret Weis and Tracy Hickman, the Dragonlance Chronicles, this series was one of the first official Dungeons & Dragons books which revolutionized the fantasy genre. Created by Toonz, a South Korean animation studios in association with Paramount Pictures, Dragonlance – Dragons of Autumn Twilight masterfully recreates this amazing novel into a full length feature movie. Featuring the talents of Kiefer Sutherland, Lucy Lawless, Michael Owen Rosenbaum and Michelle Trachtenberg, this movie is hopefully the first in a long line of movies that are based on the original novels. The tale revolves around a group of fighters, wizards and clerics who are drawn into an ancient mystery that revolves around the lost gods of yesteryear as they must prevent Verminaard from enacting his nefarious scheme. It's a classic tale of good versus evil with almost insuperable odds and is set in a rich and magical universe. Although the animation of Dragonlance may appear quite basic, the story has quite a few adult themes, however the dialogue is quite clichéd and simple at times that sometimes goes against the tale. Unfortuantely at the end of the day, the film seems like a poor imitation of the Lord of the Rings saga due to the simplistic and almost 1980’s animation technique that also uses computer generated characters which unfortunately don’t mix. 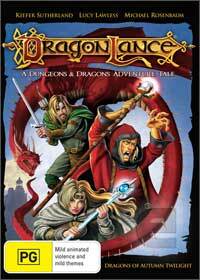 Although the story will definitely attract new viewers with the younger DVD market, fans of the original series will appreciate the homage to a much simpler time and at the end of the day, Dragonlance – Dragons of Autumn Twilight is still an enjoyable fantasy movie that will leave some clamoring for more.